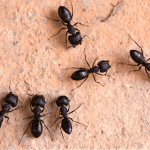 Carpenter Ants Extermination Suffolk County | EcoTech Pest Control Inc.
Brown to black in color and is about 1/16″ – 1/8″ in length. These ants produce a strong stinky odor when crushed (thus the name Odorous house ant.) The colonies are very large with multiple queens. 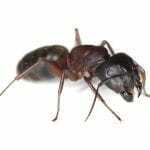 These ants are known to be tough, the queens can live weeks without food and workers and scouts can carry on tasks while being injured. 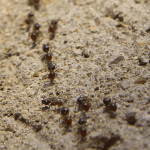 Odorous ants love sugary foods and will find their way into your home through any crack in the foundation or seam in your construction, and will begin nesting in wall voids behind sheet rock or plaster. If your home is on a slab or crawl space, they will simply nest beneath your home and come up through plumbing or electrical work. Small and brown in color. Pavement ants nest in cement and pavement cracks (hence the name Pavement ants). These ants will look for food up to 30 feet away from their nests. If scouts find a food source inside your house, they will infest your home. Pavement ants have the potential to bite, although they are not poisonous, it can hurt. A trained EcoTech Professional can effectively eliminate the nests within your home, by controlling the the exterior of the home, without the need of exposing yourself or your loved ones to harmful chemicals. Start your prevention before Spring arrives. Do not leave food out and try to keep all surfaces of your home clean. Look for any opening where ants can enter your house. Patch any cracks in your walls and windows. EcoTech Pest Control Inc. uses various methods to eliminate ant problems. Our goal to solving ant infestations is to locate and destroy the colony. We use many different target specific baits which help keep our environment safe. Along with baits, we create barriers that will help to control future infestations. As with all programs, EcoTech Pest Control offers monitoring and pro active measures that are the foundation of a pest free environment. Call EcoTech Pest Control (631) 887-3028 or (516) 226-0988 to schedule your free inspection.